For more than 30 years, undergraduates at Eastern Mennonite University have been required to immerse themselves in a culture different from their own before graduation. This unusual requirement was the focus of a luncheon address by EMU President Loren Swartzendruber on September 8. 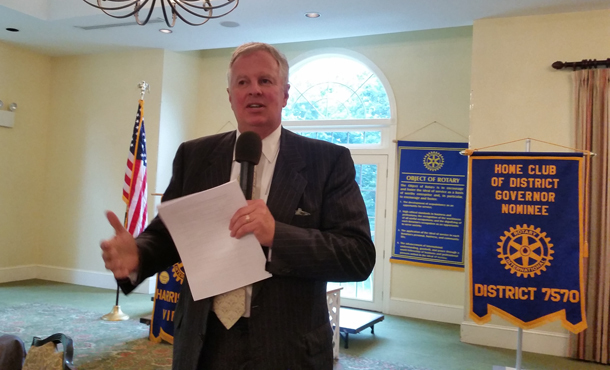 Speaking to about 100 members of the Rotary Club of Harrisonburg dining at Spotswood Country Club, Swartzendruber offered several stories to explain the transformative impact of the cross-cultural experience, including one involving his son Steven. Steven did his cross-cultural in Central America as a 20-year-old in the spring of his junior year. Inspired by that experience, he did a year-long service stint in Mexico after graduating in 2000. There he lived with a family whose host mother became ill. Steven was holding her hand when she died. He returned to EMU to earn an MDiv in 2005. Today, as a 36-year-old hospice chaplain, he often relives his Mexico experience by being present for, often holding the hands of, people who are dying. For students who feel unable to spend a semester off campus, such as some collegiate athletes, Swartzendruber said EMU offers shorter-term possibilities, often during the summer. “But we would prefer that our students do their cross-cultural internationally and for a full semester,” he said, adding that “internationally” typically means in a second- or third-world country, rather than in a “posh” location. He cited standout volleyball player Sara Ritchie – who graduated from a local public high school – for choosing to go to Spain and Morocco in the fall of 2013, though she missed a season of playing. The cross-cultural sparked her interest in doing three years of service in Central America after she graduates this academic year. “We don’t send them as a single student to take a course in a university on their own,” he said. EMU sends students as a cohort, accompanied by a faculty or staff member who typically has years of experience in that culture. The first question from the audience after Swartzendruber’s talk pertained to the process by which EMU selects the homes where students stay during their cross-culturals. The president noted that the university’s decades of experience with these trips, coupled with the on-the-ground knowledge of the EMU trip leaders, has enabled the university to build up a base of host families and to know how to locate other suitable families as needed. Another questioner wanted to know about opportunities for people from other countries to study at EMU. Swartzendruber cited EMU’s Intensive English Program, which has attracted more than 1,000 students from 62 countries since it began in 1989 and is one of the fastest-growing programs at EMU. Once these IEP students have mastered English, they often go on to enroll at EMU or at other area colleges and universities. He also spoke of EMU’s 20-year-old Summer Peacebuilding Institute, which hosted 184 students from 36 countries in 2014. Since its founding, the institute has brought more than 2,800 participants from 121 countries to Harrisonburg. Finally, he noted that about 37 percent of EMU’s incoming class is “diverse,” meaning they are not Caucasians from the United States. The luncheon wrapped up with a Rotarian offering his congratulations to EMU for having a Nobel Peace Prize winner (Leymah Gbowee) and a sitting president of a country (Somalia) among its alumni group.